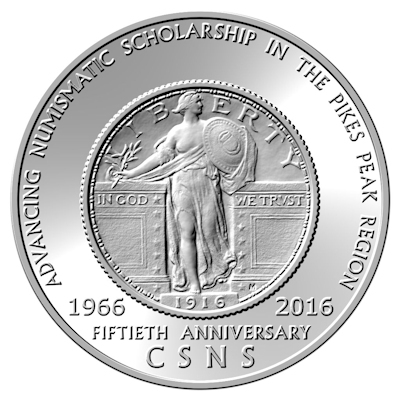 The Colorado Springs Numismatic Society was founded in 1966 and in 2016 we celebrated 50 years advancing numismatic scholarship in the Pikes Peak region. Our membership has included many nationally prominent numismatists among who are Adna G. Wilde Jr.; Al C. Overton; Barbara Gregory, Editor of The Numismatist; Edward C. Rochette; Gerome Walton; Kenneth E. Bressett; Kenneth L. Hallenbeck; 2015 American Numismatic Association Young Numismatist of the Year, Steven Roach; William C. Henderson and many others. 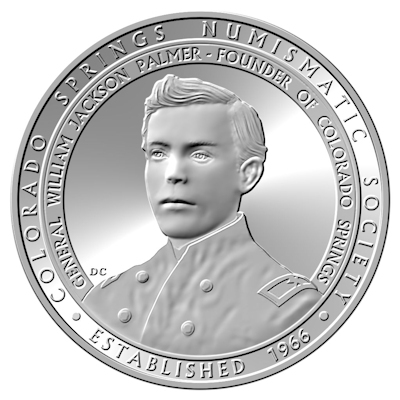 To celebrate this event the Colorado Springs Numismatic Society engaged renowned coin designer and medalist Daniel Carr and his Moonlight Mint to design and strike a commemorative medal. Mr. Carr submitted the winning design for the New York and Rhode Island Statehood Quarters while the Maine quarter design used by the Mint was based on his concept. World Coin News awarded his Rhode Island quarter design its' 2001 Coin of the Year (COTY) award as the best "Trade" (circulating) Coin in the world. Mr. Carr also submitted designs that reached the finalist stage for the Wisconsin, Florida, California and Colorado quarters as well as for the reverse of the Sacagawea Dollar. Issued in gold, silver, copper and brass versions, the obverse of our medal features an image of General William Jackson Palmer, the founder of Colorado Springs. During the Civil War General Palmer commanded the 15th Pennsylvania Cavalry and was awarded the Congressional Medal of Honor. The reverse of the medal depicts a 1916 Standing Liberty Quarter which was first issued 50 years prior to the founding of our club. The initial striking has a satin finish while a second striking has a proof-like finish.